Today we are going to tell you about a very important trick about How To Backup iPhone contacts. So friends in this tutorial we will show you the best ways to backup and migrate contacts with iOS. Say you’re picking up a new iPhone and you want to make sure all that information is properly saved and able to be migrated to your new device .well there’s a couple easy ways to do that a couple of which Apple has already provided and we can check out a third-party solution as well if you’re already using iCloud. Follow some simple steps to backup your iPhone contacts. You want to go to your settings> application and open up the iCloud tab. Go ahead and check and just see where the slider is for the contacts if it’s in the green position you’re probably already using iCloud. If you click to Turn it off you’ll be prompted to either keep what’s on the iPhone or delete what’s on the iPhone. Probably want to keep it in case you want to sync with iTunes or one of the other options we’re going to show you. Also, Check – How to Hide Photos, Apps Or Messages in Yor iPhone. Backup your contact with PC. After that’s all said and done it’s usually, a good idea to hop on to iCloud come on your browser on your computer and throwing your credentials and open up the contacts application there just make sure everything’s the same as it was on your iPhone after completing that iCloud sync now say you don’t trust iCloud you don’t want to use it whatever the case there is always iTunes and that’s why we kept information on the device so going back and looking at the contacts field again we just want to make sure that that is kept on the iPhone and that way we can plug it into our computer and perform a backup with our Mac or our PC. Simply going to the Info Tab you’ll have the option in the menu bar on the left side to click on the sync option or tick that and sync to the contacts application on the Mac and don’t forget to click apply to set that sync in motion. 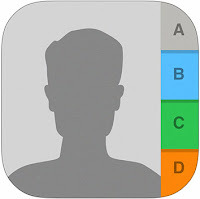 How to Backup iPhone Contacts with Third Party App. Now we will tell you about third-party solutions and our team designed this nifty app My Contacts Backup it’s a free purchase on the App Store. Just makes a real quick concise backup of all of your contacts and it makes it what’s called a V-card file it’s a very commonly used file type especially on Mac computers and iOS devices so you guessed it. it’s going to make one of those of all of your library of contacts and they will warn you if you have some big photos attached to any of those contacts but rest assured still only 11 megabytes. Steps To Backup Your Contact With The App. First, you have to install the app from app store named My contact Backup. After installing that app you have to open the app on your device. Now you will see the Backup Button Tap on it. Then you will see how much contact backup and also there you will see the email option. You can go ahead and make a quick little email to yourself and they include some instructions in case you’re confused but this is probably the quickest and most the concise way to at least backup the contacts. So if you want to do it as a last resort or just a way to make sure it’s all there go for it anyway those are a couple options on how to get those contact saved and moved to a new device. Hope you guys found it helpful and we’ll meet you with a new article till then keep reading www.iosbuckets.com don’t forget to share us. If you have any queries you can comment us on comment box our team will reply you to fix the issues. Thanks for visiting us and Stay connected with us on our official Facebook Page iosbuckets.